Here at Bounce News, one of the daily task is finding out how we can constantly give you value. With that in mind, we will be giving those of you in Lagos daily traffic updates. Today has been quite eventful with a bus exploding in flames in Lekki and a trailer falling around Ojuelegba. Some areas are affected but most places are still free as at the time of this report. From Lekki towards Ajah is free at the moment on both sides of the road. Third Mainland bridge is free as well while the traffic towards the Mainland is already building on Eko Bridge. Same goes for Carter Bridge. A major part of Ikorodu road is free flowing except for those heading towards Ketu. Same can not be said for Ikorodu to Mile 12 as movement is at a standstill. 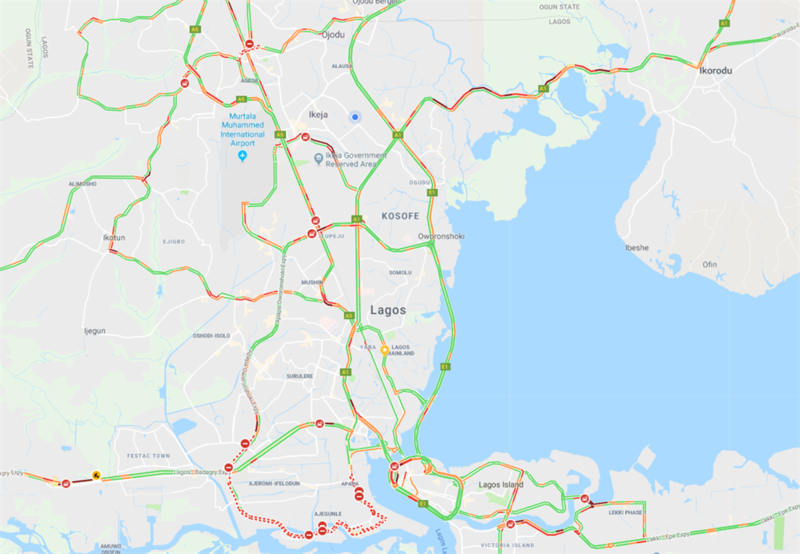 For those heading towards Abule Egba, Iyana Ipaja, Agege and evirons, the road is free till you pass Ikeja Along, traffic is moving slowly after that point interspersed with a little free flow from point to point.